Freesat may have taken a long way to become reality, but in just a few short months the service has already become a roaring success, with the path to subscription-free HD services having helped it to reach 100,000 users since May. 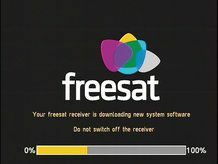 The road to Freesat started five years ago, when the BBC abandoned encryption on its satellite broadcasts, but it was another two years before ITV followed suit. Indeed, Freesat owners are currently the only people who can watch ITV's limited HD programming through their red button on certain shows and sporting events. Freesat claims that it has enjoyed "strong, steady growth throughout what has been a tough summer for high street retailers" but Sky remains strong, with over 10 million subscriptions now on the BSkyB books. So what can you expect from Freesat? How does the UK's independent satellite TV platform compare to Freeview, and to its pay-TV rivals? And is it worth getting instead of instead of Sky, Virgin Meda or Freeview (which will eventually have its own HD services)? We'll answer all these questions and more, with our complete guide to everything Freesat. Freesat finally came to life on May 6 this year. The service's key selling point is that there's no contract or subscription, just the cost of the set-top box and installation. Unlike Freesat from Sky, which has a set £150 cost and delivers a standard Digibox with a single-room installation, there are a range of Freesat receivers and installation options depending on which retailer you visit. It's available online and in-store from Argos, John Lewis, Currys Digital and Comet but a number of independent electrical retailers are also being licensed to sell Freesat. It's available to 98 per cent of UK homes, using a standard 45cm minidish. To many, Freesat will solve the great problem with Sky – cost. If you want the whole deal it can set you back £57 per month. What many don't realise is that Sky also offers a 'Freesat from Sky' service. A one-off £150 payment buys you minidish installation, a Sky Digibox and a special viewing card that 'unlocks' the channels (most notably Five's and FilmFour) that are encrypted solely to prevent reception overseas. Another even cheaper option is getting Freesat or Freesat from Sky if your house already has a working minidish on the wall (installed, perhaps, by a previous tenant) or a satellite TV outlet. BBC HD is on Freesat now, with a prime-time schedule that will expand over the next few years into the afternoon. The BBC's hi-def services are broadcast in 1080i with Dolby Digital 5.1 surround audio. ITV has started to show selected programmes including Champions League football in HD; indeed, currently this is not even available on Sky HD.